A fantastic pair of earrings. This is a 100% natural pair of diamond. this is gold 14k. earrings do not have a stamp of 14 K. 100% acid tested. gold color is White. earrings weight 1.41 grams. Clarity of a diamond VS2. Ladies Necklaces. Browse All Ladies Chains. Ladies Pendants. Princess Cut (Square). Quality Diamond Jewelry For Less. Diamond Chains. Three-Piece Trio Sets. Custom Diamond Pendants. We at Adamas Diamonds have taken the fear factor out of buying diamonds online and include a certified appraisal and gemological report with every item. This is only the beginning of the story and continues by adding to the draft of the jewel, the enormous versatility involved in the actual production. Jewelry Style: Studs. You can choose between White or Yellow Gold, with Screw or Push Backs. Jewelry Type: Earrings. Stone Cut: Round. Stone Type: Genuine Diamond. Jewelry Style: Studs. You can choose between White or Yellow Gold, with Screw or Push Backs. Carat Weight: . 75ctw (other sizes available). Jewelry Type: Earrings. 14K White Gold 0.80CTW Round Natural Diamond Push/Screw Back Studs w/Gift Box! Diamond Earrings. Diamond Bracelets. Ladies Diamond Bracelets and Bangles. Diamond Necklaces. Diamond Charms. Diamond Crosses/Jesus Pendants. Colored Diamond. Heart Shape. Stock # 31067 Estimated Retail Value: $3,699.00 Item Type: Stud Earrings Precious Metal: 14 Karat Solid White Gold Total Weight: 1.00 Grams Gemstone: Diamond 100% NATURAL Diamond Weight: 0.97 Carats t.w. - 2 Princess Brilliant Average: 4.20 x 4.40 MM Diamond Color: H -I Diamond Clarity: VS 2 Backing: 14K Gold Screw Backs Condition: Brand New *It is very difficult to source such a perfectly matched pair of diamonds in these sizes especially when trying to stay at a low price point but we got lucky on the buy so we are passing on this sweat deal to our dear eBay friends and family. * CHECK OUT DAILY ON OUR NEW POSTED ITEMS. VERACCI JEWELS has been in the market for almost 48 years. We are a known jeweler located at downtown Los Angeles, California. Diamond Earrings. Diamond Bracelets. Ladies Diamond Bracelets and Bangles. Diamond Necklaces. Diamond Charms. Diamond Crosses/Jesus Pendants. Heart Shape. The diamond setting includes 11 round cut diamonds set in an invisible setting. Diamond Clarity: VS2. Shape: Round. Main Stone: Genuine Diamond. Total Carat Weight: 0.80CT. Diamond Studs Earrings 14K White Gold 0.91 TCW G H VS2 Round Brilliant VG Cut. Round Diamonds. Princess Diamonds. Oval Diamonds. Heart Diamonds. Marquise Diamonds. Pear Diamonds. Cushion Diamonds. You can choose between White or Yellow Gold, with Screw or Push Backs. Carat Weight: . 75ctw (other sizes available). Stone Cut: Round. Stone Type: Genuine Diamond. 40 round brilliant cut diamonds (.80ctw). - Diamonds are F color and VS2 clarity. - 4.1 grams. You are Purchasing a 0.9 ct Total Weight 18K White Gold Round Brilliant Cut Diamond Twisted Setting Stud Earrings. The earrings weigh 3.4 grams. 18K White Gold. Diamond Earrings Settings. The earrings and the backings are stamped "750". Color: White (GH). Clarity: VS2 - SI1. Main Stone: Genuine Enhnaced Diamond. Shape: Round, Brilliant. Total Carat Weight: 0.80CT. Diamond Eternity Wedding Band. Diamond Drop Earrings. Diamond Earrings. Diamond Hoop & Huggie Earrings. Diamond Semi Mount Ring. Total Carat 0.95 ct. Round Cut Diamond Stud. Diamond & Color Stone Pendant. .85 Carat Natural Diamonds in 14k Solid White Gold Push Back Stud Earrings. EARRINGS WEIGHT IS 1.0 gram. Gold Purity: 14k.85 Carat Total Diamond Weight. Color: G-H.
Earring Type: STUD. Diamond Color: GHI. Diamond Clarity: VS-SI. Primary Stone Type: Lab-Grown Diamond. Diamond carat weights (CT.) represent the approximate total weight (T.W.) of all diamonds in each setting and may vary no more than. 07 below the stated weight. The 2 GENUINE and NATURAL blood red ruby GEMSTONES weigh. 42 carats total weight. They are for pierced ears. In general any VS2 diamond that has been either graded by GIA or AGS will be eye clean! For this very reason you should never go lower than the VS2 clarity grade. It simply is nothing but a waste of money. .85 CTW (Clarity VS2-SI1 / Color G-H). Total Round Diamonds Carat Weight is -. EARRINGS WEIGHT IS 1.1 grams. Nice looking pair! DIAMOND CLUSTER SCREW BACK EARRINGS. DIAMOND CLUCTER STUD EARRINGS. BRILLIANT CUT. 14K WHITE GOLD. 14K White Gold. Mouse over images to see enlarged version. Screw Back. TOTAL DIAMOND WEIGHT. GIA 6167495020. GIA 1196522051. Gram Weight. Certified Diamond Information. Diamond Information. Photos have been enlarged to show detail. Resizing and Fees. Solitaire Rings. 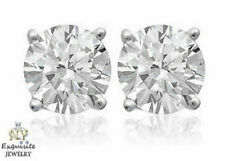 Diamond Stud Earrings 0.8CTW (Center Stone 0.4ct) in 14K White Gold. Each stone is hand picked and inspected making sure that it has the ultimate sparkle and brilliance. Clarity: VS2. 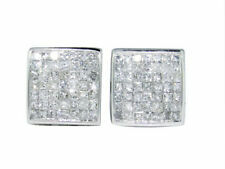 .80 Carat Natural Diamonds Push Back Stud Earrings Made in 14K Solid White Gold. Total Diamond Carat Weight is -. 80 Carat. EARRINGS WEIGHT IS 1.1 gram. Gold Purity: 14k. .90 Carat Natural Diamonds Push Back Stud Earrings Made in 14K Solid White Gold. Total Diamond Carat Weight is -. 90 Carat. EARRINGS WEIGHT IS 1.2 gram. Gold Purity: 14k. Solitaire Rings. This is only the beginning of the story and continues by adding to the draft of the jewel, the enormous versatility involved in the actual production. Don't hesitate to reach us for any desire. Signity Diamond's are bright white man made diamonds with more sparkle than natural diamonds. 14K White Gold. They are bright and sparkly and display more fire than the best grade of diamonds as shown in the table below. Exquisite. 80 Carats Natural VS2-SI1 Diamond 14K Solid White Gold Stud Earrings. Total Natural Round Cut Diamonds Weight.80 Carats (both earrings) VS2-SI1 / H. Total Earrings Weight is: 1.2 grams. All pictures are magnified to show the smallest of details. Diamond Earrings. Diamond Bracelets. Ladies Diamond Bracelets and Bangles. Diamond Necklaces. Diamond Charms. Diamond Crosses/Jesus Pendants. Heart Shape. Colored Diamond. Aleena Solitaire. Princess Cut. Ladies Pendants/Crosses. Ladies Diamond Bracelets. Diamond Crosses/Jesus. Colored Diamond. Heart Shaped. Round Shape. Clarity (Natural Enhanced) VS2. 4.00 Carat . Heart Diamonds. Round Diamonds. Weight 0.82 Carat. Diamond Rings. Type Diamond. Shape Round. Beautifully hand crafted, these 14k white gold basket style earrings features two round brilliant diamonds with a total weight of 0.91 carat (approx 0.46ct each). These diamonds were certified by AGI laboratories as a 100% Natural Diamonds, J color, VS2 clarity enhanced and Ideal Symmetry. To emphasize the true brilliance of the piece our jewelry designer chose 4-prong setting. The certificate report accompanied with These earring states the characteristics of the diamond and with estimate retail value of $2,862. At Diamond Traces, your satisfaction is guaranteed and your money is fully protected by our 30-Days 100% money back guarantee.